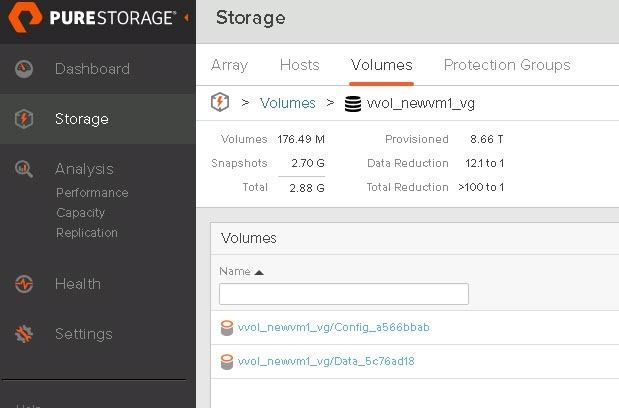 Virtual Volumes solve a lot of the problems VMware and/or storage admins face today. The central problem is one of granularity. If I want to leverage array-based features I don’t have the option to apply it at a VMDK or even VM level. I set it on a volume (a VMFS datastore). So it is all or nothing, for every VM that is on that VMFS. If I want to replicate (for instance) a single VM, I had to either replicate the volume and every one else on it. Or move it to a datastore that is replicated. But how do I know that volume is replicated? How do I make sure that volume STAYS replicated? Well with VMFS you can use plugins and extra software to handle this. But it is still not in the intelligence of VMware–and once again not a particularly useful granularity. Config VVol--every VM has one of these and it holds the VMX file, logs, and a few other descriptor files. 4 GB in size. Swap VVol--every VM has a swap VVol that is created automatically upon power-on of the VM and deleted upon power-off. Data VVol--for every virtual disk, there is a respective volume on the array that is created. Different configurations and policies can be applied to each one. Now what a VVol looks like and is reported as depends on the underlying array to a certain point. On the FlashArray, it is no different than any other volume. Therefore it can be used with the features you use today and managed in the same way. 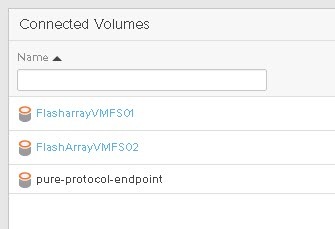 The only major difference between a VVol and a “regular” volume (like one hosting a VMFS) is really just how it is addressed by a host. A “regular” volume is presented with a normal LUN ID, so let’s say 255. A VVol is a sub-lun, so it would be 255:4 for instance, it is addressed through a primary volume. 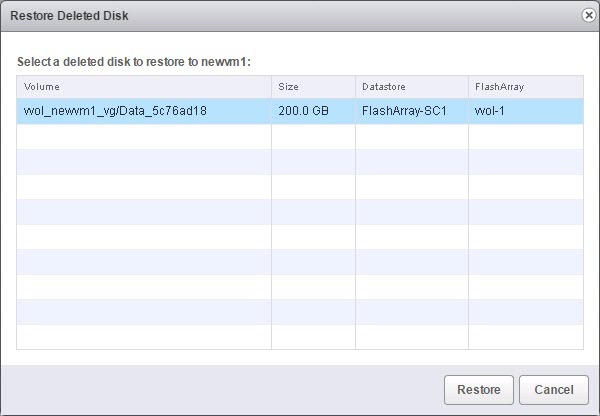 Now that we have virtual disk granularity on the array, we can ditch the VMware snapshots. VMware snapshots do well in a pinch, but aren’t meant for any amount of long term life and can hurt performance when in existence and during the consolidation when deleted. But since we have this granularity and the connection through VASA, we can use FlashArray snapshots instead! 100% deduped when created, so no capacity consumption upon creation. 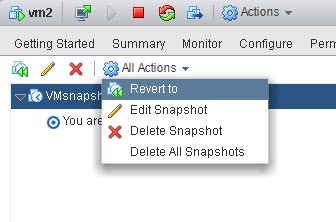 So now when you click on a VM that uses VVols and choose create snapshot, it actually creates a FlashArray snapshot. 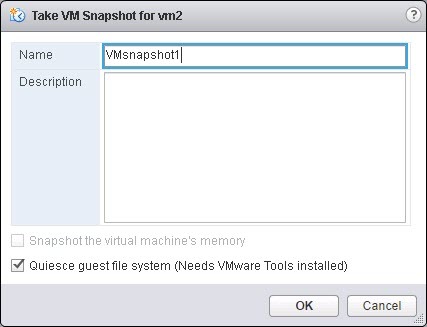 If you have VMware tools installed, you can have it quiesce the guest filesystem before taking the FlashArray snapshot, giving you the benefit of per-virtual disk granularity AND file system consistent snapshots. There are two “types” of snapshots too. There is a managed snapshot. This is a snapshot that VMware “knows” about, in other words one created via VMware (whether that be the GUI, PowerCLI etc.). Then there is an unmanaged snapshot. This is a snapshot that VMware doesn’t “know” about. Essentially one that was created directly on the array. Both can be used to restore from. VMware only knows about the managed ones, the FlashArray knows about both the managed and unmanaged snapshots. So what is this primary volume? Well it is called a protocol endpoint. A PE is essentially a mount point for a VVol. This is the only volume you need to manually provision to a ESXi server. Multipathing is configured on this volume, so are things like queue depth limits etc. On the FlashArray, one protocol endpoint is automatically created when the Purity Operating Environment is upgraded to the version (5.0) that includes VVols. This volume is called “pure-protocol-endpoint”. You can connect this PE to the host or host groups in which you plan on provisioning VVols to. 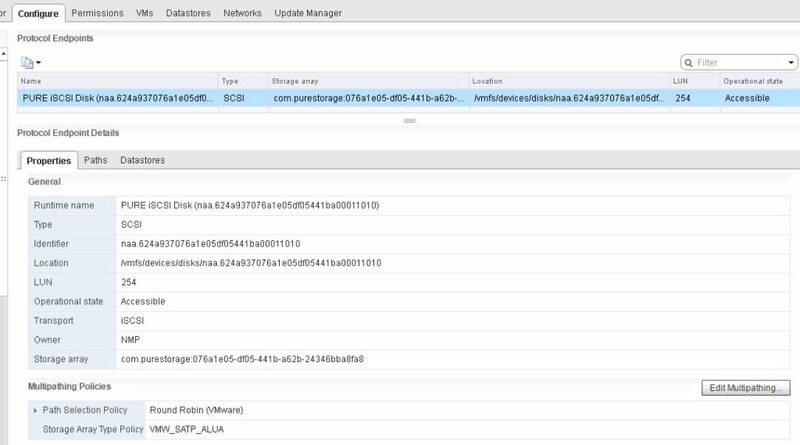 When a new VM is created (or a new virtual disk), the VVols are created and the array “binds” them to the appropriate PE that is connected to that host. Do we support more than one PE? Yup. Do you need more than one PE on the FlashArray? Like ever? I would say a pretty emphatic no. The auto-created one should be suffice for all hosts. Look for a blog in the near future where I will go into more detail on that. So with no VMFS anymore, what are you choosing when you provision a VM? What are you choosing from if there is no more datastore? Well, a very nice design feature of VVols in general by VMware is to not change the look/feel/experience of VM provisioning and management too much. So VMware admins don’t really need to learn new processes to use VVols instead of VMFS. So in the case of VVols, there still is a datastore, it is just not a filesystem or a physical object. A VVol datastore, also called a Storage Container is what you choose now. A storage container doesn’t really have configurations applied to it. How a VVol is configured is based on the capabilities assigned to it in a VMware storage policy. More on that later. 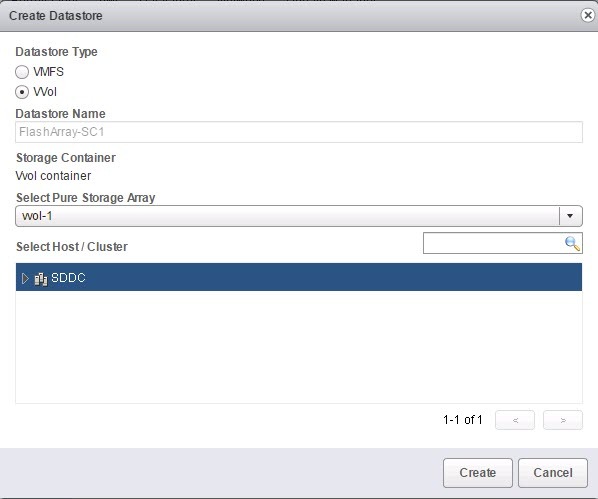 A storage container represents one array and one array only, this is a requirement of the VMware VVol design. Currently the FlashArray auto-creates your storage container and it defaults to 8 PB, though this size is configurable. It is important to note that at current we only support one storage container per FlashArray. This generally should not be a big deal, because since array based features are applied at a VVol level, not a datastore one. So the concerns of the past of having multiple datastores (replication granularity, snapshot granularity, restores, reporting, etc.) are exactly that–things of the past. That being said, we will be introducing multiple storage container support in the near future. We decided to delay it mainly due to the fact that we have a feature coming out a bit later than VVols that will fit nicely with the storage container object type. 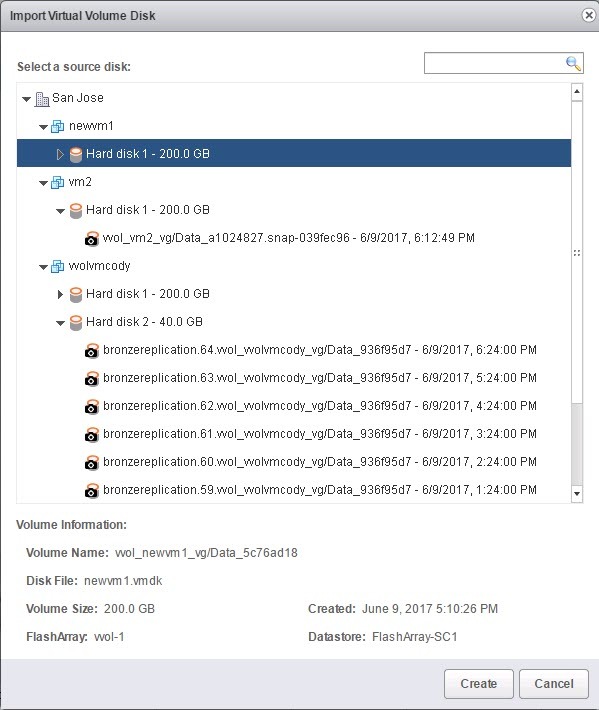 Note that a SC shows up like a datastore, and is mounted in the same process as a VMFS–through the add storage wizard. So that takes care of the physical connectivity and datastores, but what about communication between vCenter and the FlashArray? Well this is where VASA comes in. 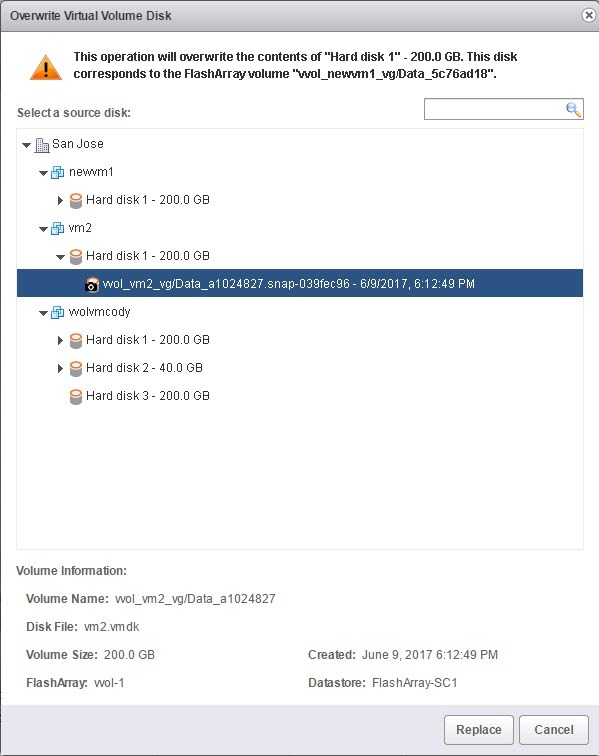 The vSphere API for Storage Awareness (VASA) was introduced back in vSphere 5.0 and provided some basic communication between an array and VMware to indicate how a VMFS volume was configured (RAID level, tiering, replication etc). A few vendors supported VASA 1.0 and very few customers actually used it (in my experience). In vSphere 6.0, VASA 2.0 was released. This included the initial release of VVols (version 1). In vSphere 6.5, VASA version 3.0 was released and VVols version 2.0 came with it. 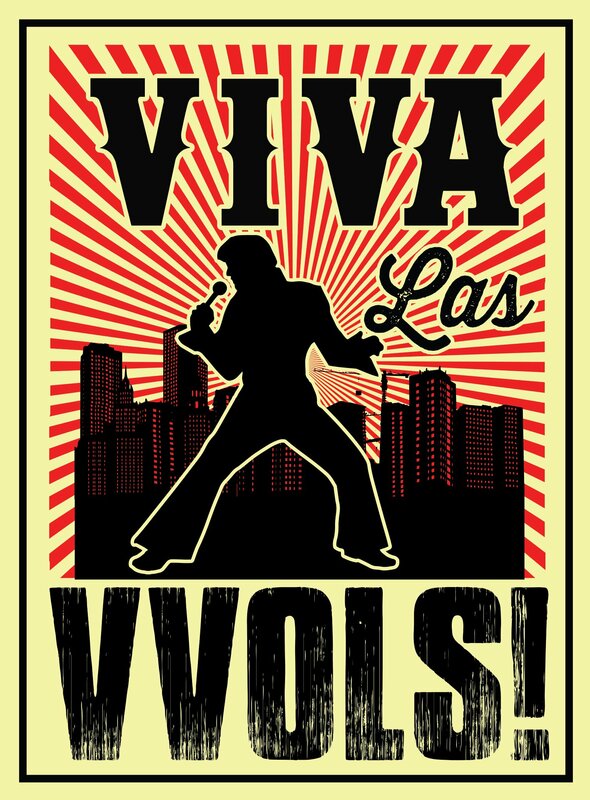 The main difference between VVols 1.0 and VVols 2.0 is replication. Before VVols 2.0, array-based replication was not supported by VMware. You could technically use array-based replication if the array supported it, but there was no good way to actually implement disaster recovery, because it wasn’t in the VASA specification. This missing feature slowed down VVol adoption for version 1 quite a bit. The FlashArray VASA Provider is version 3. So this means to deploy the FlashArray VVol implementation, you need to be on vSphere 6.5. There are quite a few benefits of 6.5, so I think moving as soon as possible to it is a good idea regardless. Runs inside of the FlashArray controllers. There is no need to deploy a VM and configure HA for our VASA Provider. Each controller runs a copy of the provider. Our provider is active-active. Either VASA instance can accept calls from vCenter. There is no VASA “database” with the FlashArray. As far as the controllers are concerned the VASA service is stateless. All of the binding information, VVol identifiers, etc are stored in the same place as your data. On the flash. So if you lose both controllers somehow. Just plug in two new controllers and turn them on. The VASA service will start and pick up where it left of. No need to restore or rebuild anything. When you register our VASA provider with vCenter, the FlashArray will tell vCenter about all of the possible FlashArray capabilities. What these capabilities are is entirely up to the vendor, in this case Pure. So what do these capabilities mean? Well once you have registered the provider, you can create storage policies inside of vCenter with a mixture of these capabilities and if you want VMware capabilities (like IOPS limits etc.). Once you create a policy you can assign it to a VM. You can do this after a VM has been created or when you are provisioning a new one. Below I am deploying a VM from a template and I am assigning the policy above. vCenter automatically tells me which storage is capable of fulfilling this policy by marking them compliant. 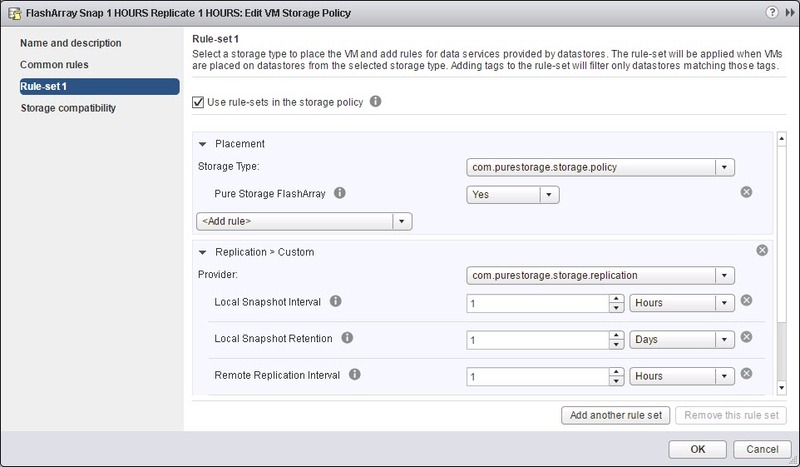 When you choose a policy, vCenter will filter out all datastores that are not compliant with that policy. So what does it mean to be compliant? Well, the storage container for the FlashArray is compliant if the respective FlashArray has one or more protection groups that matches the policy. A FlashArray protection group is essentially a consistency group with a local snapshot and/or replication policy applied to it. It will match as specific as you indicate. If you just say 1 hour snapshot and that’s it, all protection groups that have a 1 hour snapshot policy will be returned. Some might also be replicated, some may not. If you want it to return compliancy for 1 hour snapshots but NOT be replicated, you would indicate replication capable as No. Since I am choosing a policy that has a snapshot/replication capability in it, I have to choose a replication group. For the FlashArray, a replication group is a protection group. This is how I can choose which protection group I want it to be in. A really nice benefit of policy-based provisioning is not just initial placement. But ensuring your VVols stay that way. If I go to a protection group that a VVol is in and change the replication schedule from 1 hour to 30 minutes, VMware will mark that VM or virtual disk as non-compliant. Now you can either fix the configuration, or re-apply the policy to the VM so it can be properly configured by VASA. Cool stuff. In a nutshell, that is the FlashArray VVol architecture. But there are some additional benefits I haven’t got into yet. Here are just a few. This includes real time reporting, and historical, on the VM or the volumes. Also with the FlashArray, you can now see how well each virtual disk is reducing. Virtual disk undelete. When you deleted a virtual disk from a VM on VMFS, you needed to resort to something backup that hopefully was configured. With the FlashArray, even today, when you delete a volume it goes into our destroyed volumes folder for 24 hours. For 24 hours it can be recovered. So you get this same benefit with VVols because they are volumes. So if you delete a virtual disk from a VM you have one day to revert the deletion without any pre-configured backup (of course you should always still use backup appliances for important VMs, but this gives you some “oops” protection). Simplicity. Seems like an obvious thing, but this really makes a big difference with VVols. VMware leaves a lot of room for vendors to make decisions and this can lead to complexity. We have strived to make our VVol implementation as simple as possible, and I think we really have. 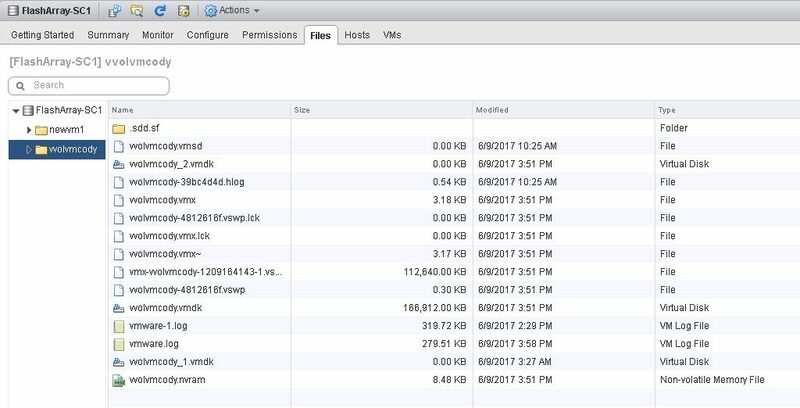 After your Purity upgrade, you can configure and start provisioning VVols from scratch to your VMware environment in a few minutes. 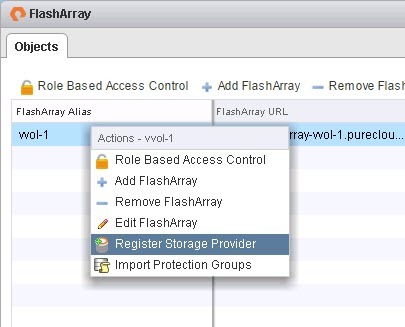 So moving from VMFS to VVols on the FlashArray actually gives you better data mobility, not worse. It’s actually the opposite of what many had feared about supposed additional lock-in with VVols. Because there is no proprietary file system (VMFS) these issue goes away. Storage Container/Protocol Endpoint provisioning. Before you mount a storage container you need to have a protocol endpoint provisioned to the ESXi hosts you want to mount it on. So this requires you to use the GUI/CLI/REST to add the PE to the host or host group then mount the SC inside of vSphere. With our plugin this whole process is automated. Choose the cluster, we will then provision a PE to the hosts (if needed) then mount the SC, all in a few clicks in one spot. VVol Tab for a VVol-based VM. This shows the underlying volume information from the FlashArray for the virtual disks of that VM. Also there are a few workflows, you can access them on this tab or through the right-click menu of the VM. VM Undelete. We automate the process mentioned earlier in this blog to restore a deleted virtual disk. Finds any VVols in the destroyed volumes folder that belongs to selected VM. You choose the VVol and we import it and attach it back to the VM. Import Existing VVol or VVol Snapshot. This action allows you to take a VVol-based virtual disk (or any snapshot of it) of a VM and present a copy of it to another VM that is on the same array. This is a nice feature for dev/test of a database for instance. Overwrite an Existing VVol with a VVol or a VVol Snapshot. This action allows you to take a VVol-based virtual disk (or any snapshot of it) of a VM and present a copy of it to another VM that is on the same array. Similar to the previous case, but overwrite instead of creating a new copy. Configuration of VASA and Storage Policies. 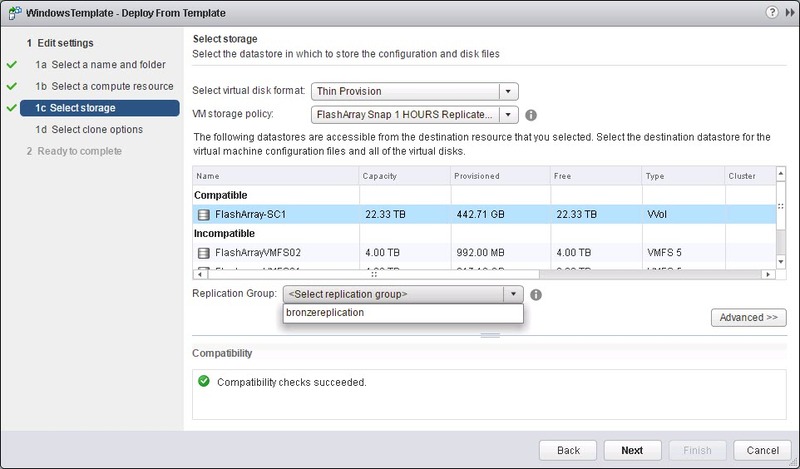 In the home screen of the FlashArray vSphere Web Client Plugin there are few new features that will help configure your VVol and FlashArray environment. Register VASA Provider. Click on a FlashArray and choose register storage provider. This will register both VASA providers on that array with vCenter. Auto-creation of Storage Policies. To automatically create some storage policies, you can import the protection groups on your FlashArray and the plugin will convert their configuration into a storage policy. Their local snapshot interval and retention and their replication interval and retention for instance. So that’s it for now! We are finishing up our beta, so depending on feedback there still might be a few minor changes here and there. Will be blogging a lot more details in the coming weeks and months. Can you expand some more on vm reporting capabilities? Can we do a top 10 vm view by IOPs/Throughput worst dudupe/best dedupe? Also your video demo is marked as private. Video has been fixed. Thanks for reminding me! I will put a post together to talk more about reporting. In short, not a lot of top X will be in the standard GUI, expect more of that type of stuff to be in Pure1. Though this can certainly be done via REST (PowerShell, Python etc). And when I finished reading your post, I though : ” wow ! What an amazing , promising and groundbraking association (Vsphere + Pure) ” ! It will now be hard to wait Purity v5 and authorization from Pure Support Team to deploy it on my arrays ! Congrats to Pure engineer team who worked on this! And keep on going ! Glad you feel that way! 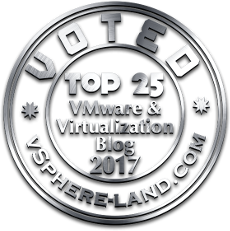 We are just starting to scratch the surface on what will be possible with VMware and VVols on Pure. Very excited to see what further testing provides and to see what customers do with it! Thank you! I will pass your congrats along! Cody, This is kinda unrelated to the vvols, but when we purchased our Pure at the beginning of the year, there was talk of adding filesharing capabilities to Purity so we could host our fileshares directly from the Pure vs hosting them on a server. Do you have any updates on that by any chance? Great post. Thorough explaination of current VVOL development state and Pures thoughts and actions on VVOL implementation. Do you know if synchroness replication between Pure arrays (activecluster) will be supported in Pures VVOL implementation? Thank you! At GA we will not have ActiveCluster support with VASA. That being said, in theory VVols could still be put into a ActiveCluster pod so they could be sync-repped, just that awareness would be unknown to VMware. Support for this will come at a later date–there are a lot of considerations (and really cool possibilities) with A/A and VVols that need to be ironed out. so we need some more time to do that part right. One year later, are PODS capable of host VVOLS in an activecluster ? 6 months later, any updates on activecluster with vvols? This is still being worked on–there were quite a bit of things that needed to be completed internally to get this fully done. We are progressing on it–that I can assure you. Our VVol/VASA support is not quite released (very soon!) so that is a preview post. Stay tuned on my blog, as soon as it is released I will post about it. Cody what impact does loss of connectivity have to the array on TCP 8084? and when is communication to this port used? If you lose connectivity to your VASA providers your VMs continue to run uninterrupted. With that being said, you will not be able to PowerOn new VMs or create new ones, or add VVol disks etc. This is the reason having a highly-available VASA provider is particularly important and why we run it on-array redundantly. Since the array will be more-or-less directly exposed to guests when using VVols (as opposed to going through the VMDK abstraction layer), will ODX functionality be available to Windows guests running on VVols in VMware? This would be a highly desirable benefit; all file transfer between all VMs in the same array would become array-internal. As of now, no. VMware still virtualizes volume VPD information and I do not think it is capable of relating ODX token exchanges even if Windows wanted to try. It generally can only work on pRDMs–VVols are more akin to vRDMs. Something I would love to see supported in the future. But my suspicion is that it would require changes in ESXi to do it. How far do vvol’s scale in number of VM’s per flasharray? Since every VM consists of potentially dozens of volumes I assume this boils down to how many volumes a pure flasharray supports? Any information on this? 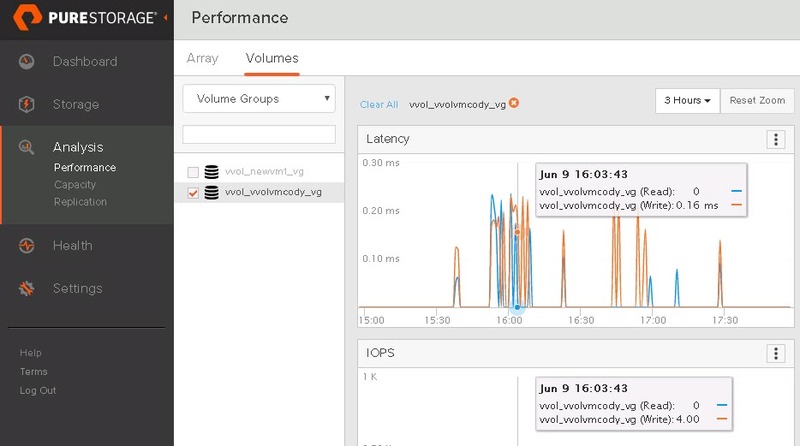 Current limits are 5,000 volumes per array–which is certainly not enough for larger VM environments. We are hard at work as we speak on increasing this. Thanks Cody, that’s good to know. That would probably limit vvols to a couple hundred VM’s in most environments if I had to guess. Do snapshots also count against this 5000 volume limit? Last question somewhat unrelated: From what I can find replication seems only possible over ethernet with the flasharray. Is replication over FC on the roadmap? Yeah it ends up being any where between 500-1000 VMs. As far as snapshots are concerned, it depends. If you take VMware-initiated snapshots, then yes volumes are created on the FlashArray. We have to do this because they need to be readable/writeable/host addressable. Or you assign a storage policy though for snapshots, it will indeed create snapshots. That is on our roadmap, I cannot comment on timelines here, but if you need more specific information around when/how etc, your account team can help you there. Are there any more details available in regards to setting up replication for VVols? I haven’t been able to find much details on this topic.